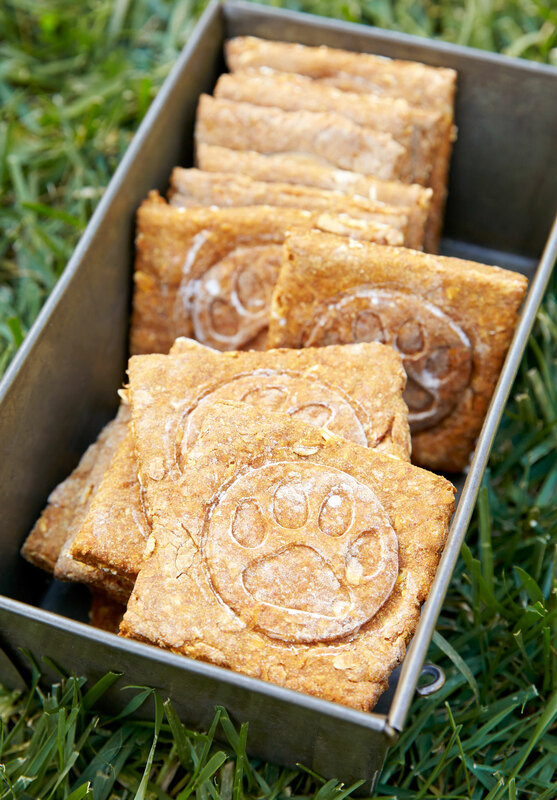 Let your pups in on the fall fun with a pumpkin treat of their own! Preheat oven to 300°F. Line two large cookie sheets with parchment paper; set aside. In a large saucepan combine apple juice, pumpkin, honey, and oil. Bring to simmering, stirring frequently. Remove from heat. Stir in oats; cool slightly. Stir in whole wheat flour and cinnamon. Stir in all-purpose flour until combined. Divide dough in half. On a lightly floured surface, roll half of the dough at a time into a 10-inch square. Using a pastry wheel or a knife, cut dough into 2-inch squares. If desired, lightly press a dog-shape cookie cutter into each square to make an indentation. Place squares close together on the prepared cookie sheets. Bake on separate oven racks for 45 minutes, rearranging baking sheets halfway through baking. Turn off oven; let dry in oven overnight. Makes 50 treats. Place dog treats in an airtight container; cover. Store in the refrigerator for up to 1 week.